Walker Kirtland Hancock (June 28, 1901 – December 30, 1998) was an American sculptor and teacher. He created notable monumental sculptures, including the Pennsylvania Railroad World War II Memorial (1950–52) at 30th Street Station in Philadelphia, Pennsylvania, and the World War I Soldiers' Memorial (1936–38) in St. Louis, Missouri. He made major additions to the National Cathedral in Washington, DC, including Christ in Majesty (1972), the bas relief over the High Altar. Works by him are at the United States Military Academy (West Point), the Library of Congress, the United States Supreme Court Building, and the United States Capitol. During World War II, he was one of the Monuments Men, who recovered art treasures looted by the Nazis. Hancock was awarded the National Medal of Arts in 1989 and the Presidential Medal of Freedom in 1990. Interview with Walker Hancock (1989), National Sculpture Society, via YouTube. He won the 1925 Rome Prize, and spent the next 3 years studying at the American Academy in Rome. Hancock served in the U.S. Army during World War II, and became one of the "Monuments Men," recovering art looted by the Nazis. Because he spoke fluent Italian, Hancock was recruited into Army intelligence, where he wrote a handbook for soldiers serving in Italy. He won the national competition to design the Air Medal (1942), established by President Franklin D. Roosevelt, to honor "any person who, while serving in any capacity in the Army, Navy, Marine Corps or Coast Guard of the United States subsequent to September 8, 1939, distinguishes, or has distinguished, himself by meritorious achievement while participating in an aerial flight." On December 4, 1943, three weeks before being shipped overseas, he married Saima Natti (1905–1984) in a chapel at the National Cathedral in Washington, D.C. Later, he would make major additions to the cathedral, including the altarpiece for the Good Shepherd Chapel (1957); half-life-size statues of Ulrich Zwingli (1965) and Martin Luther (1967); Christ in Majesty (1972), the bas relief over the High Altar; and a life-size statue of Abraham Lincoln (1984). Hancock was posted in London in early 1944, where he researched and wrote reports on monuments and art works in occupied France. Hancock died in 1998 in Gloucester, Massachusetts. Hancock's first major commission was the Jessie Tennille Maschmeyer Memorial Fountain (1931–32) for the St. Louis Zoo. A drinking fountain featuring a pedestal flanked by twin basins, the severe Art Deco-Pueblo architecture of its granite base served as inspiration for Hancock's central figure, a Zuni Bird Charmer. :21 The larger-than-life-sized figure of a loin-clothed kneeling man with a bird perched on each wrist, won Hancock PAFA's 1932 Fellowship Prize. :279 The fountain is located beside the east entrance to the zoo's Bird House. For Trinity Episcopal Church, Topsfield, Massachusetts, Hancock created an immersive sculpture group, The Garden of Gethsemane (1965–66). On one side of a garden, a kneeling figure of Christ, seen from behind, agonizes about offering himself up for sacrifice, while on the other side his disciples, Peter, James, John, huddle together asleep. The sculpture group was commissioned as a memorial to Jonathan Daniels, an Episcopal seminarian murdered during the Civil Rights Movement. A duplicate of Christ Praying is at Rev. Daniels's alma mater, the Episcopal Divinity School in Cambridge, Massachusetts. A duplicate of the 2-part work is at a Trappist monastery in Kentucky. Zuni Bird Charmer (bronze, 1931–32), Bird House, St. Louis Zoo, St. Louis, Missouri. Pedimental sculpture group: The Bond of Postal Union (limestone, 1934), Pennsylvania Avenue facade, New Post Office Building (now William Jefferson Clinton Federal Building), Washington, D.C. (with Adolph Alexander Weinman). 5 bas relief busts: Beatty, Foch, Pershing, Diaz, Jacques, (bronze, 1934–35), Liberty Memorial, National World War I Monument, Kansas City, Missouri. Architectural sculpture, 5 bas relief panels: The Round Up, First Plowing, Coming of the Railroad, Pioneer Founders, River Traffic (limestone, 1936), north façade, Kansas City City Hall, Kansas City, Missouri. 4 monumental sculpture groups: Vision, Courage, Sacrifice, Loyalty (granite, 1936–38), Soldiers' Memorial, St. Louis, Missouri. 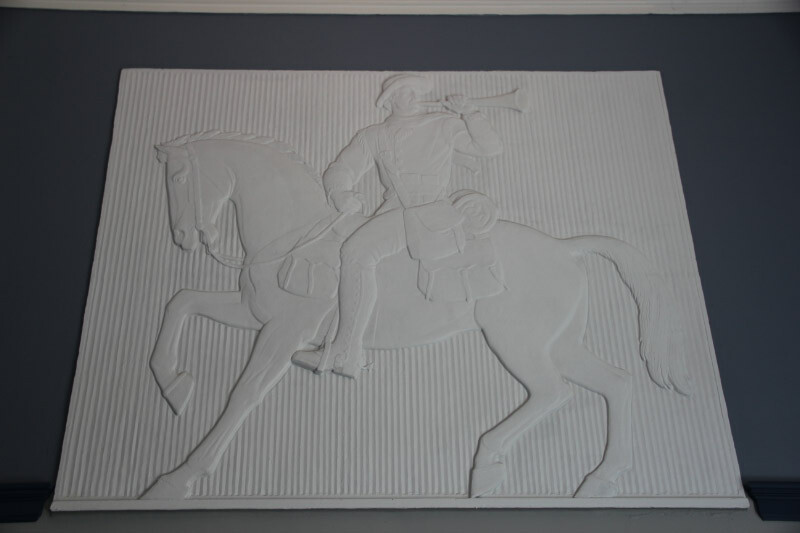 Bas relief panel: The Post Rider (marble, 1936–38), West Springfield Post Office, West Springfield, Massachusetts. Bust: Piatt Andrew (bronze, 1938), Museum of Franco-American Cooperation, Blérancourt, France. A replica is at American Friends Service Committee Headquarters in New York City. Triton Fountain (plaster, 1938–39, destroyed),:66 1939 New York World's Fair, Flushing, Queens, New York City. A one-third-scale version of one of the triton figures is at Elizabeth Gordon Smith Park, Gloucester, Massachusetts. Judge Charles Lincoln Brown (marble, 1940), Philadelphia Municipal Courthouse, 1801 Vine Street, Philadelphia, Pennsylvania. Bust: Stephen Collins Foster (bronze, 1941), Hall of Fame for Great Americans, Bronx, New York City. Frank P. Brown Medal (bronze, 1941), awarded by the Franklin Institute, Philadelphia, Pennsylvania. Bas relief plaque: The Spirit of St. Louis (marble, 1941–42), Missouri History Museum, St. Louis, Missouri. Hancock's allegory for Charles Lindbergh's 1927 flight across the Atlantic Ocean features Saint Louis (King Louis IX of France) launching the flight of a falcon. World War II Memorial Tablet (bronze, 1947–49), Central High School, St. Louis, Missouri. Inscription: "Central High School: To Those Who Gave Their Lives For Their Country, 1941–1945." Bust: Robert Frost (bronze, 1950), Museum of Fine Arts, Boston, Boston, Massachusetts. Angel of the Resurrection (bronze, 1950–52), Pennsylvania Railroad World War II Memorial, 30th Street Station, Philadelphia, Pennsylvania. Hancock's one-third-scale plaster model is at the Museum of Fine Arts, Boston. President Dwight David Eisenhower Inaugural Medal (gold, 1953), Corcoran Gallery of Art, Washington, D.C.
Hancock also created the 1957 inaugural medal, which features profiles of both President Eisenhower and Vice-President Richard M. Nixon. John Joseph Eagan (bronze, 1953–55), American Cast Iron Pipe Company, Birmingham, Alabama. Relief bust: Andrew W. Mellon (marble, 1954), National Gallery of Art, Washington, D.C. Bust: Woodrow Wilson (bronze, 1956), Hall of Fame for Great Americans, Bronx, New York City. Bust: Governor Percival P. Baxter (bronze, 1956), Maine State House, Augusta, Maine. Bas relief panel: World War II and Korean War Memorial (1957), Loudon County Courthouse, Leesburg, Virginia. John Paul Jones (bronze, 1957), William M. Reilly Memorial, Philadelphia Museum of Art Sculpture Garden, Philadelphia, Pennsylvania. The Good Shepherd (Istrian stone, 1957), Bowker Memorial Fountain, All Saints Episcopal Church, Worcester, Massachusetts. In 1995, Hancock donated a bronze version to St. Mary's Episcopal Church, Rockport, Massachusetts, as a memorial to his wife. Vice President Alben W. Barkley (bronze, 1960–63), Kentucky State Capitol, Lexington. Paul Weeks Litchfield, (bronze, 1961), Goodyear Tire and Rubber Company, Akron, Ohio. Confederate Memorial (granite, 1917–72), Stone Mountain, Georgia. Hancock supervised its completion, 1964-72. The Garden of Gethsemane (bronze, 1965–66), Trinity Church, Topsfield, Massachusetts. A replica is at The Abbey of Our Lady of Gethsemani, Bardstown, Kentucky. 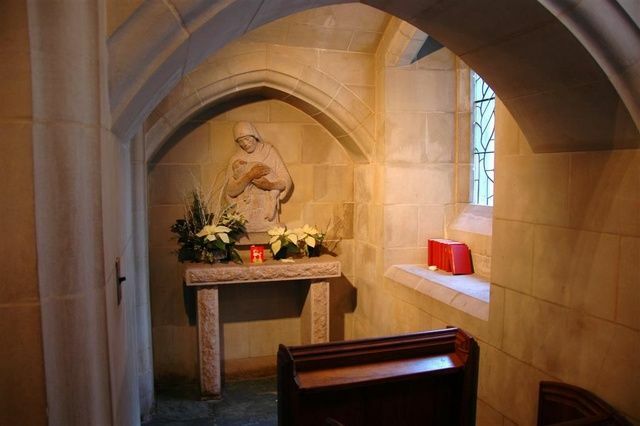 A replica of Christ Praying is at the Episcopal Divinity School, Cambridge, Massachusetts. Air (bronze, 1978–82), Fairmount Park, Philadelphia, Pennsylvania. Arion on a Dolphin (bronze, 1989), Dunn Tower, Methodist Hospital, Houston, Texas. Bust: W. E. B. DuBois (marble, 1993), Memorial Hall, Harvard University, Cambridge, Massachusetts. General Douglas MacArthur (bronze, 1969), MacArthur Monument (West Point). A duplicate of this is at the MacArthur Memorial, Norfolk, Virginia. Bust: General Leslie R. Groves (bronze, 1975). Christ the Good Shepherd Altarpiece (limestone, 1957), Good Shepherd Chapel. Carved by Roger Morigi. Niche figure of Ulrich Zwingli (limestone, 1965). Carved by Roger Morigi. Niche figure of Martin Luther (limestone, 1967). Carved by Roger Morigi. Christ in Majesty (limestone, 1972), bas relief over the High Altar. Carved by Roger Morigi (with Frank Zic). Statue of Abraham Lincoln (bronze, 1984), west end of the Nave. James Madison (marble, 1974–76), James Madison Memorial Building. Bust: Chief-Justice Earl Warren (marble, 1977). Bust: Chief-Justice Warren E. Burger (marble, 1983). Bust: Vice-President Hubert H. Humphrey, Jr. (marble, 1981–82). Bust: Vice-President Gerald R. Ford (marble, 1984–85). Bust: Vice-President George H. W. Bush (marble, 1990–91). At upper right: The Bond of Postal Union pediment (1934), New Post Office Building (now part of the William Jefferson Clinton Federal Building), Washington, D.C.
Bas relief busts (1934–35), Liberty Memorial, Kansas City, Missouri. River Traffic (1936), Kansas City City Hall, Missouri. John Paul Jones (1957), Philadelphia Museum of Art Sculpture Garden, Philadelphia, Pennsylvania. Paul Weeks Litchfield (1961), Goodyear Tire and Rubber Company, Akron, Ohio. Vice President Alben W. Barkley (1960–63), Kentucky State Capitol. Confederate Memorial (1917–72), Stone Mountain, Georgia. Hancock supervised its completion, 1964-72. Chief Justice Earl Warren (1977), U. S. Supreme Court Building, Washington, D.C. Vice-President Hubert H. Humphrey, Jr. (1981–82), U. S. Capitol, Washington, D.C.
Chief Justice Warren E. Burger (1983), U. S. Supreme Court Building, Washington, D.C.
For his military service, Hancock was awarded the American Campaign Medal, the World War II Victory Medal, and the European-African-Middle Eastern Campaign Medal. He served as a member of the Smithsonian Institution's National Collection of Fine Arts Commission. He was elected an associate member of the National Academy of Design in 1936, and an academician in 1939. He was inducted into the American Academy of Arts and Letters in 1941. For his body of work, he was awarded the Pennsylvania Academy of the Fine Arts's Medal of Honor in 1953, and the National Sculpture Society's Herbert Adams Medal of Honor in 1954. The U.S. Congress awarded him the National Medal of Arts in 1989. President George H. W. Bush awarded him the Medal of Freedom in 1990. From 1930 onwards, he kept a studio in Gloucester, Massachusetts, to which he ultimately retired. Saima Natti Hancock, his wife of 40 years, died in 1984. The Cape Ann Historical Association mounted a 1989 retrospective exhibition of his works, and published his autobiography, A Sculptor's Fortunes (1997). He endowed Massachusetts's Walker Hancock Prize, given for excellence in the arts. The National Sculpture Society has an annual prize named for him. His papers are at the Archives of American Art, Smithsonian Institution, and in the Hancock Family Archives in Gloucester, Massachusetts. Several of his works can be found at Saint Mary's Episcopal Church, Rockport, Massachusetts. He and his wife are buried at Seaside Cemetery, Gloucester, Massachusetts. In the 2014 film The Monuments Men, the Sgt. Walter Garfield character played by John Goodman is loosely based on Hancock. ^ "Interview with sculptor Walker Hancock". National Sculpture Society, via YouTube. 1989. Retrieved May 2, 2017. ^ Walter Barlow Stevens (1921). Centennial History of Missouri. St. Louis, Missouri: S.J. Clarke Publishing Company. p. 76. ^ a b c d e f g A Sculptor's Fortunes. ^ a b c d e f g h i j Crouse & Ambler. ^ a b c d e f g James-Gadzinski & Cunningham. ^ Captain Walker K. Hancock from Monuments Men Foundation. ^ Walker Hancock from The Monument Men. ^ George McCue, et al. Sculpture City, St. Louis: Public Sculpture in the "Gateway to the West" (Hudson Hills Press, 1988), p. 92. ^ Zuni Bird Charmer, from SIRIS. ^ a b c Charles A. Lindbergh, The Spirit of St. Louis (New York: Charles Scribner's Sons, 1953), p. 530. ^ a b Charles Lindbergh Plaque, from St. Louis Art Museum. ^ Robert and Company (15 August 2005). Master Plan Amendment Report - Georgia's Stone Mountain Park (PDF) (Report). Stone Mountain Memorial Association. p. 7. Retrieved 21 December 2017. 1925 Borglum is dismissed and Augustus Lukeman is hired as sculptor. Lukeman removes Borglum's work and begins his own design. ^ a b Garden of Gethsemani from Flickr. ^ Zuni Bird Charmer from Flickr. ^ Bond of Postal Union from Smithsonian Institution. ^ The Post Rider, from the Living New Deal. 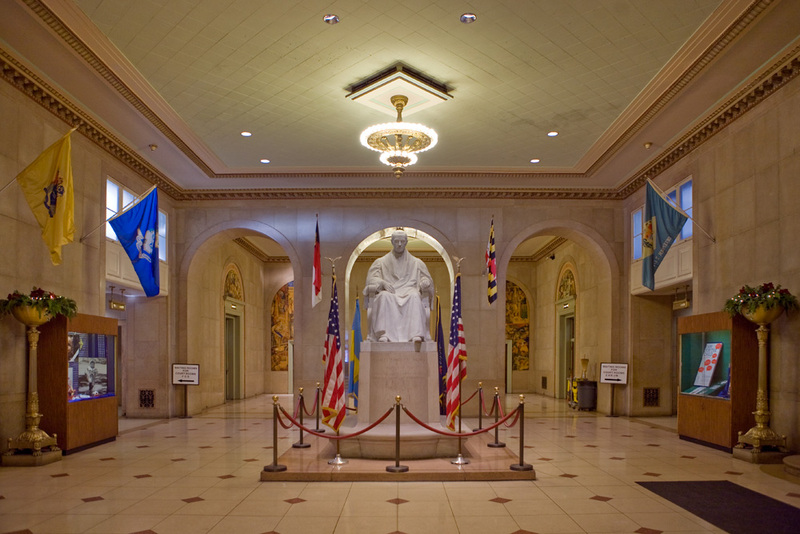 ^ "Piatt Andrew Memorial". Retrieved 2012-04-12. ^ Little Triton from Flickr. ^ Judge Charles Lincoln Brown, from Hidden City Philadelphia. ^ Stephen Foster from Bronx Community College. ^ Robert Frost from Museum of Fine Arts, Boston. ^ Andrew Mellon from SIRIS. ^ Woodrow Wilson from Bronx Community College. ^ Governor Baxter from Flickr. ^ WWII & Korean War Memorial, from Panoramio. ^ John Paul Jones from www.ushistory.org. ^ The Good Shepherd, from Gargoyles and Grotesques. ^ The Good Shepherd (Rockport, MA). ^ Scale model of Air from Flickr. ^ W. E. B. DuBois from Arts at Harvard. ^ General Groves from SIRIS. ^ Good Shepherd Chapel from Pinterest. ^ Ulrich Zwingli from SIRIS. ^ Martin Luther from SIRIS. ^ High Altar, from Washington National Cathedral. ^ Stephen Foster from Museum of Fine Arts, Boston. 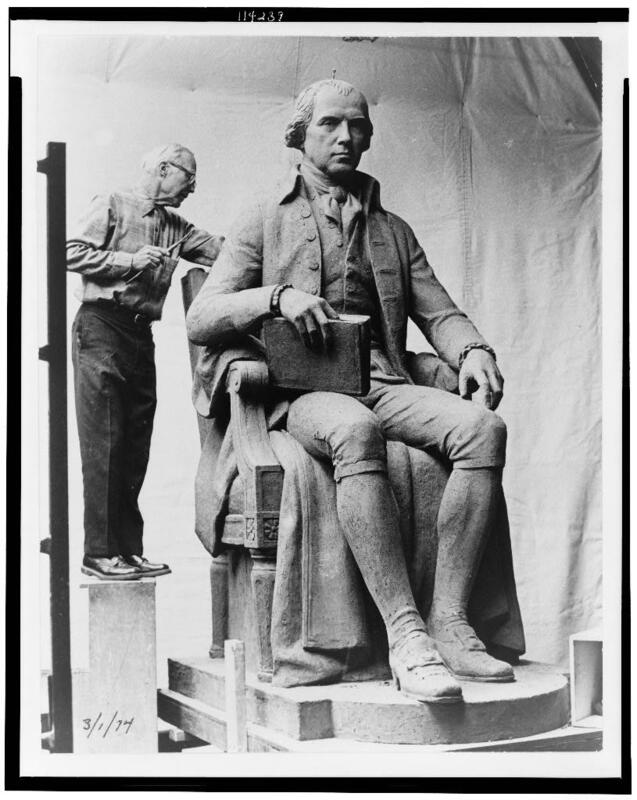 ^ Hancock at work on the James Madison sculpture (1974) from Library of Congress. ^ Vice-President Humphrey from U. S. Senate Art Collection. ^ Vice-President Ford from U. S. Senate Art Collection. ^ Vice-President Bush from U. S. Senate Art Collection. ^ "Walker Hancock Papers". Siris-archives.si.edu. Retrieved 2012-04-12. ^ "Meet Gloucester's Monuments Man: Walker Hancock," Gloucester Times, February 7, 2014. Walker Hancock, "Experiences of a Monuments Officer in Germany", College Art Journal, 5:4 (May 1946), College Art Association. Timothy Crouse & Louise Todd Ambler, The Sculpture of Walker Hancock, exhibition catalogue (Gloucester, MA: Cape Ann Historical Association, 1989): introduction, biographical essay, afterword, checklist of works, 1919-88. Walker Hancock, A Sculptor's Fortunes: A Memoir (Gloucester, MA: Cape Ann Historical Association, 1997). Susan James-Gadzinski & Mary Mullen Cunningham, "Walker Hancock, b. 1901", American Sculpture in the Museum of American Art of the Pennsylvania Academy of the Fine Arts (PAFA, 1997), pp. 279–85. Wikimedia Commons has media related to Walker Kirtland Hancock. Photos of Hancock's public art in Philadelphia. Philart.net. Oral history interview with Walker Hancock at Smithsonian Archives of American Art. Obituary, The New York Times, January 2, 1999. Obituary, The Washington Post, January 3, 1999. This page was last edited on 15 February 2019, at 19:59 (UTC).